No worries it is not an obligation. When the voting post will be published your entry will be there regardlelss! Really had to rush this one, so I went for something within my comfort zone. Initial idea was a ragtime piano saloon tune, but that would have been a bit too hard to do within one day. The track photo IS from a proper saloon in Leon, Mexico though (taken last week)! This inn is a nice place to rest by the sea, just imagine some waves and seagulls making noise in the background while you rest. Here's my entry. I went for a more Japanese sounding tavern or izakaya sound that's inspired a little by enka. I just wish I had the equipment to record at least the guitar part myself. That VST guitar sound is not exactly great. It is voting time again! TL;DR: Pick top 5. Comments appreciated, but not mandatory. Each voter chooses top 5 entries. The most favored pick gets 5 points, fourth 4 points etc.. The voter gets 1 points for voting. The participant with highest TOTAL is assigned a score of 10, followed up by 8, 7, 6 ... 1 (never less than 1). If the TOTAL, is a tie, both participants are assigned with the same values as if they won the position alone. 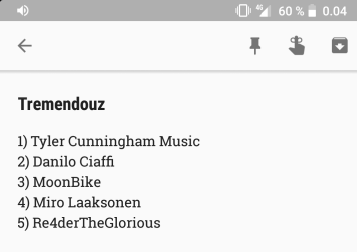 No 'honorable mentions' will be counted with this many participants. 1. MoonBike- Man, something about the fiddle (and flute/ocarina?) in this track just did it for me, it's just so funky and they play off one another perfectly. I imagined a group of cheeky locals buttering up and conning some travelers at the bar for a free round of drinks. 2. Evan Wardell: Nice composition! Very delicate balance and blending of the instruments that comes together in an overall great sounding and soothing piece. Perfect track to play after a long adventure or epilogue to a game where the heroes are just relaxing and reflecting in a peaceful little inn. 3. Danilo Ciaffi- I found this to be the most traditionally "fantasy tavern" track, in a good way. I really enjoy this type of music, I'm a sucker for some good old fashion flute and string plucking, would be a memorable track for an in game tavern. 4. Avaruussaha- Instantly reminds of a sunset on the beach at one of those little bars on the sand. Could kick back in a chair with a beer and watch the waves to this one. 5. Miro Laaksonen- Sounds like a tune some bards would be playing in an old medieval tavern and fit the theme great. I especially enjoyed 1:40 onward. Again, well done everyone, all the tracks really were unique and a joy to listen to, big fan of tavern music As for next theme I'll go ahead and suggest racing or maybe futuristic/ space. Gives me that classic tavern vibe. I guess it fits the in theme perfectly. Not as taverny as the previous one, but the melody is so nicely-optimisticly-happily nice I could not help, but give it second place. Also, the opening reminds me of the band Zacier, which is quite amusing. The bass in that track got me. Not exactly my vision of tavern music (I am more like ethnic/folk tavern kind of guy), but I could imagine that style of music playing in some game. Was about to leave the 5th place blank, but then realized this one is quite fitting. Tried to go into this one blind, but accidentally picked the same top 5 as re4der did (albeit in a different order), whoops! Honestly, I love this track. The vibe really transports me to the space of some hazy tavern (and no I'm not just trying to paraphrase your title there lol), where a bunch of seedy characters are always crowded about. Sort of a communal place where you can grab drinks, collect less-than-legal bounties, and gamble against hustlers at some minigames. Pretty versatile in tone, too; I can imagine it fitting quite a few different visual art styles! SUPER rustic. This (along with the one that didn't qualify because it was produced for a game released like 3 years ago lol) is what made me second guess the somewhat livelier theme I'd first considered doing, because I was like welp, somebody already did this really well, so... ¯\_(ツ)_/¯ But yeah, I think that the instrumental choices achieve the expected atmosphere, time period, etc. for this kind of piece really well. The cheerfulness of this one surprised me in a good way. Like, you walk into a tavern, accidentally trip into some massive/burly guy sitting at the bar, and knock over his drink; he stands up and glares at you, at which point you're fully expecting a one-sided brawl, but then he just laughs it off, forcefully patting you on the back. You go on to enjoy a drunken night with your newfound, gentle giant of a buddy. I loved this one compositionally; really dig the violin embellishments and the mandolin transition, especially! Was originally a bit on the fence about whether this felt any more indoors than the rest of the...er, Modest Locality that it's in (what I'm learning here is that maybe I'm just a sucker for track naming conventions), but I do think that the low end coming in the way it does at 0:10 helps with that a lot. Love me some bossa vibes, and as far as the beach feel goes, I'd say this is spot on. While it does seem at place at an inn, though, it also feels as though this would sort of be an overarching beach area theme that just has minor filter changes, arrangement changes, etc. when you do go indoors for a quick...mimosa? Man idk what people drink at beaches. It was definitely tough to decide when there were so many refreshingly different takes on the theme, but I really enjoyed listening to them all! For next month's theme, I'm down for Tyler's space suggestion; I also seem to have seen a volcano setting suggested previously, and I feel like that could round out the sort of "elemental" settings you've had in the contests so far! Once again great entries everyone! Glad to see many new faces, hope you'll stick around. Gobbelgub: mix-wise very weird, but also very catchy and agree very versatile. Good job! AAAAHvaruussaha: definitely nail the "bar on the beach" vibe, where you can rest and buy some food or items by mama Rosita. Those chords are tasty. SMAC88: Despite the background and the choice of instrumentation, I have a hard time picturing this playing in a standard/relaxing tavern, probably because it always keeps me on my toes. Would probably work instead for a place where people gather to plan an under cover mission or some kind of resistance. Sorry for the delay everybody! Will give these a listen and vote today. Awesome atmosphere, definitely conveys a medieval, run-down tavern. The percussion adds a lot here! Funky and shady! I like the bass, keeps a strong groove going. First of all, great picture Very festive and upbeat tune too! This strangely reminds me of Kirby Super Star's Grape Gardens, but in a good way! Love the peaceful vibes. Cool take on the theme! It conveys a more eastern-sounding tavern, and I found myself nodding to the beat. Solemn and understated, a nice contrast with the other under entries. I especially like when the flute comes in. Very cool arrangement, I really enjoy the percussive instruments - sounds like glassing clinking together in harmony. The picks were quite tough this time, lots of different kind of entries and a few of them were competing in the same style between each other. Awesome! I get this "back home" feeling from this one. A place the protagonist is happy to return to. Groovy, I get the idea behind muted guitar in the background, but I'd still hope it was a bit more audible. The name fits very well, makes me think of a shady moonshine club. What a catchy tune! Homely and playful, makes me think of a varied crowd befitting an inn/tavern. Brings a market/fairgrounds to my mind, stuff is happening around while oogling at wares in booths. Very peaceful, I really like the subtle tremolo in the background. Seems like a lively and exotic environment, like waiters juggling trays and pouring drinks in horizontal streams. The sounds are quite appropriate, but for me its a bit hard to stay focused on the main feeling(s) the tune is trying to convey. A bit more melancholic entry, I wonder what makes the particular establishment this broody? 5th - Re4derTheGlorius for the exotic and foreing kind of place this tune paints in my head. 4th - gobblegub for the awesome underground secret bar vibe. 3rd - Danilo for the unsung dragonborns. 2nd - Moonbike for being particularly catchy and memorable, while sticking to theme very well. 1st - Evan Wardell for being the peaceful and pretty inn. 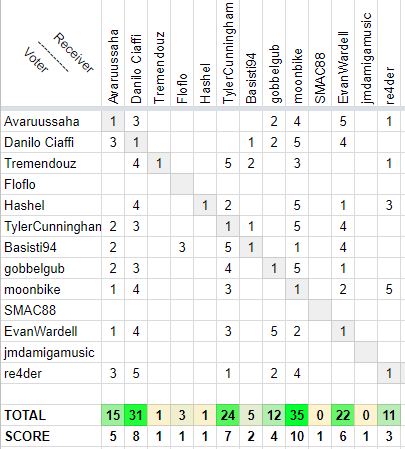 Moooooooonbike takes it, tightly followed by Danilo (assuming I didn't make any grave mistakes, the score matrix is getting biiiig)!